In case you were wondering why Bran might be trending on Twitter, it’s not because the world suddenly discovered fiber was going to be bigger than avocado toast. No, it was because fans around the world couldn’t be content keeping their excitement to themselves about the kickoff to the final season of Game of Thrones. Even in the midst of all of the ‘Winter is Coming’ memes, the big picture for online brokerages here is that audiences get excited about great content/products/performances – something that is particularly important when brokerages are fighting their own battles for attention and engagement from DIY investor audiences. While there are no dragons in this edition of the roundup, we do cover a major competition for DIY investors to take home some serious coin and for one online brokerage to get some important marketing wins. From there we peer over the fence to see what US online brokerages have been working on and how they’re getting creative to provide DIY investors what they want when it comes to trading experiences. As usual, we’ll also serve the staple Twitter chatter and forum discussions from DIY investors. While vying for control of Kings Landing might’ve been the biggest competition to make headlines this week, a slightly distant second was the launch of the annual “Biggest Winner” competition from Horizons ETFs. Sponsored once again by National Bank Direct Brokerage, this competition, which kicks off on May 6th, is for DIY investors of all stripes who want to try their hand at growing a portfolio as much as possible across the challenge time frame of six weeks. The catch is that contestants are restricted to using Canadian ETFs listed on the TSX rather than picking individual securities. Prizes for this contest consist of six weekly cash prizes of $500 and a grand prize of $7,500 for the best performance across the duration of the competition, followed by the runner up prize of $2,500. 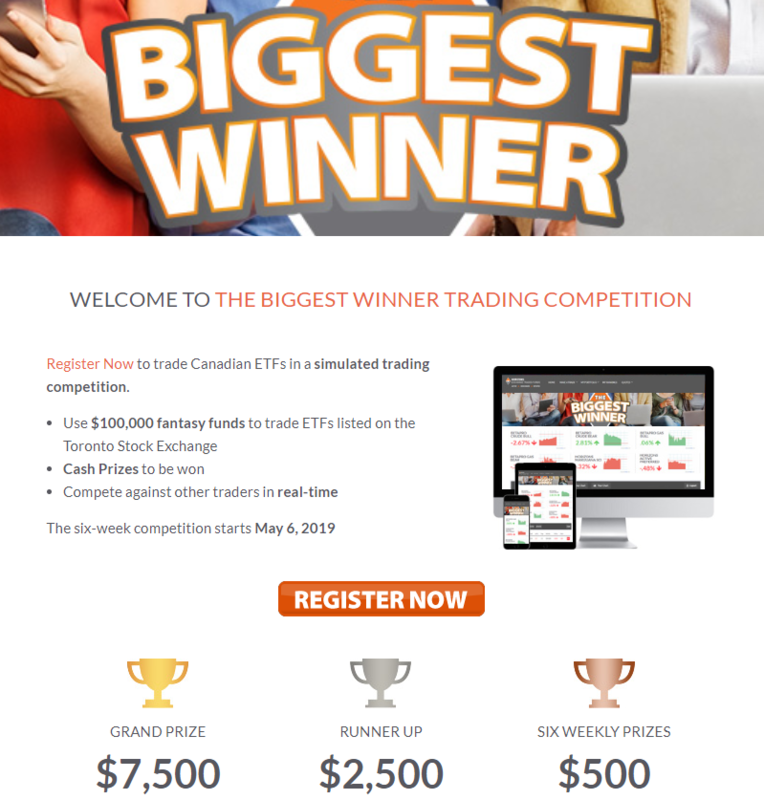 As far as trading competitions go for Canadian DIY investors, this is by far the most regular and offers the best prize value to be won. 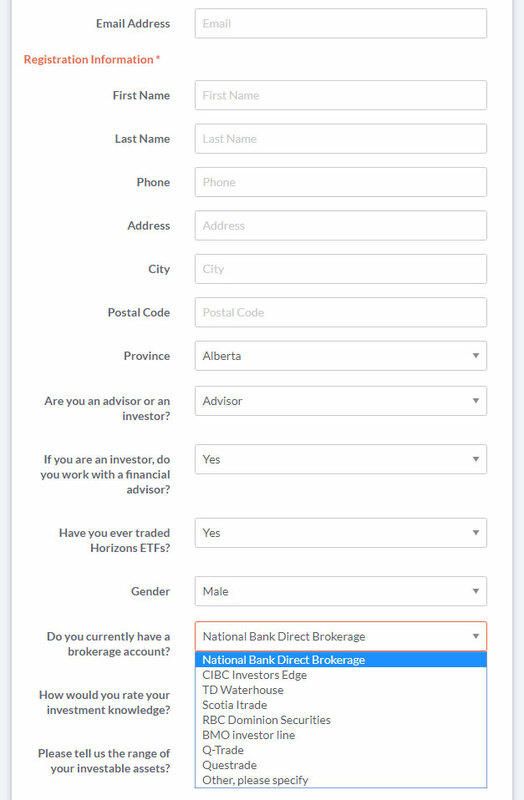 In terms of exposure, in the incredibly competitive ETF and online brokerage markets here in Canada, this competition is a tactical way in which Horizons and National Bank Direct Brokerage can be on the radar of lots of investors. Interestingly, during the registration portion of the contest, the form includes questions about which online brokerage (if any) individuals use. Conspicuously absent on the list of online brokerages are Desjardins Online Brokerage, Interactive Brokers, Virtual Brokers, HSBC InvestDirect, WealthSimple and JitneyTrade, signalling that there are a handful of brokerages of particular interest to NBDB and others that likely aren’t. While brokerages offer the occasional contest, it is remarkably rare. In a world where getting investors to pay attention, let alone offer up information (such as an email address), contests often draw the curious in to participate. For NBDB, this contest not only gives them access to DIY investors from competitor firms, it also offers them a unique opportunity to market their commission-free ETF program. Incidentally, the contest does charge virtual commissions on trades executed so there is some semblance to real life in which commissions can bite into profitability of trading. This weekend, the biggest names in music and their cadre of fans travelled to Coachella. This massive music festival, just around the bend from Palm Springs, is forecasted to bring in almost 250 thousand revelers across two weekends, and helps to put into perspective the scale at which the US market operates. For the US online brokerages, the power of scale is something they continuously look to leverage with their feature releases. This past week and earlier this month, there were some interesting moves south of the border that once again highlighted the direction that DIY investing (and more broadly online investing/wealth management) is trending towards. One of the biggest names in the US online brokerage space, TD Ameritrade, for example, announced that they are expanding 24-hr trading capabilities in certain securities. Last year, TD Ameritrade launched their foray into 24-hour trading of select ETFs and changed the way in which investors could access after market trading. It probably didn’t make as big of a splash at the time as cryptocurrency was all the rage (and already tradeable 24/7). But in a market place like the online brokerage space that is so ultra-competitive, the small improvements or boosts to their bottom line or client satisfaction are the types of things that ultimately help to maintain their market position. Whether Canadian online brokerages ultimately decide to jump into offering this kind of innovation is a function of a number of economic and regulatory realities. The point, however, is that there are examples of product lines that can be a win-win for investors looking to access certain trade opportunities and brokerages who are looking to boost earnings and gain traction with active traders. Of course, one of the drivers for the move by TD Ameritrade was the need for investors to be able to react to news. 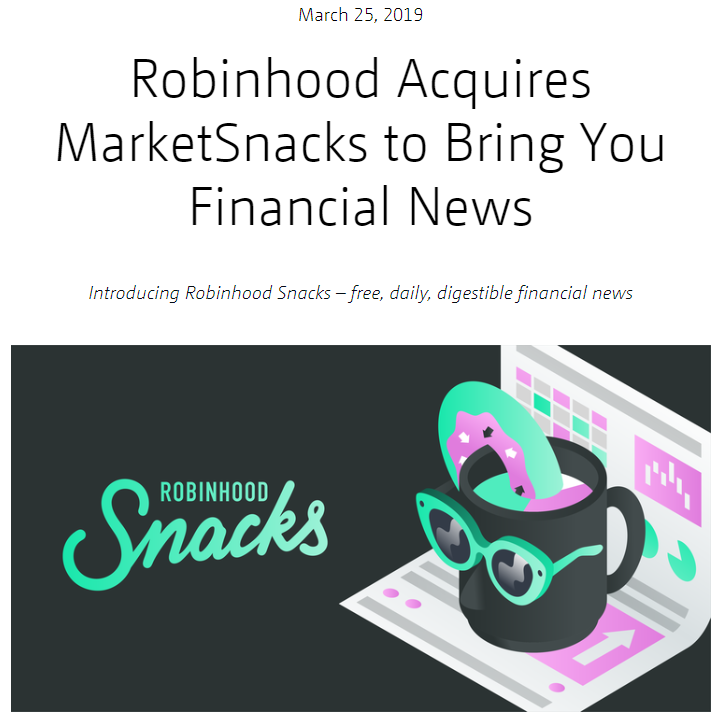 And late last month, US online brokerage Robinhood announced a rather intriguing acquisition of a market news provider MarketSnacks. Interestingly, providing access to news – especially financial news and market information – goes hand in hand with how investors formulate trading decisions and evaluate trading opportunities. Whether it is a good idea to go/stay long Boeing (or short it), whether yield curve inversion portends a recession or there’s still time in this bull market to run higher, these kinds of event-driven trading or investing decisions also appeal to a more engaged investor base. The challenge, however, is finding a format that resonates with audiences. Of course, traditional business news channels and market reporting are familiar but in 2019, they’re struggling to win a battle for attention against robots/AI who can report the ‘stats’ of the news in a fairly formulaic fashion. So, enter a format like the daily digestible news story and podcasts provided by MarketSnacks or even the full day market programming provided by Tasty Trade and the takeaway is simple: focus on the content being engaging and accessible and (funny thing) an audience will gravitate towards that content. As a result, MarketSnacks got acquired by an online brokerage looking to feed clients more market coverage and Tasty Trade’s founder Tom Sosnoff has captured the attention and admiration of a loyal audience base. Whether it’s opening up securities to being traded after hours – at any hour – or providing engaging content to DIY investors about market action in a format that fits their increasingly fragmented digital lifestyle, US online brokerages are providing yet another example of competition fueling better user experience for investors. In the case of Ameritrade, they’re getting creative about how to grow revenues based on the fascinating insight about when their users actually access the system – the point here though is that they didn’t have to lower commission prices to do it. For Robinhood, it’s especially interesting because the focal point isn’t about lowering commission prices (they’re already at zero) but rather making a tactical choice to provide value to people who are active consumers of market news – something that will invariably generate more trading activity the more engaged people are. Like planning a ridiculously over the top music festival in the middle of the desert, the fact is that people show up, endure and even look forward to the journey for the content and the experience. If there’s anything that Canadian online brokerages can take away from these developments south of the border, it’s hopefully to start thinking about getting much more creative with how they reach online investors. A newcomer to the DIY investing world has questions about how long it might take to build their knowledge base. See what advice other Redditors provided here. One forum user wants to know if changes to their portfolio are necessary as they get closer to retirement. Discover what fellow forum users had to say in this Canadian Money Forum thread. So much for investors to be on the look out for in the week coming up. In addition to actual Easter eggs, it’s earnings season again and that likely means people are bracing themselves for (even) more ups and downs. Whether that ending to Game of Thrones or general market volatility leaves your head spinning, the world can rest easy knowing that Idris Elba also spins (and will be doing so again at weekend 2 of Coachella!) and apparently so does Hodor (in real life!). Have a profitable week!